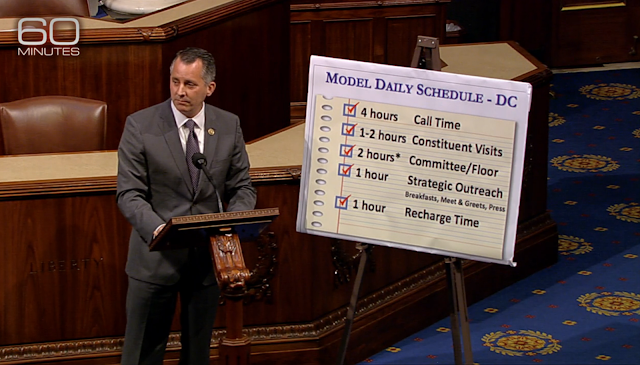 Everyone who knows how Congress works was not surprised in the least by the 60 Minutes report "Dialing for Dollars." Members spend hours every single day not working for constituents but instead focusing on their primary objective: to raise money. As 60 Minutes reported, the Congressional daily calendar is scheduled around fund raising. There aren't committee meetings during the lunch hour. That's prime telemarketing time. Members don't complain publicly even though each and every single one of them should. Voters back in the district are shocked for one primary reason: local reporters don't do their jobs. In every single television market, the member should have been held accountable by local TV reporters. They're not. The question is simple: why should TV stations licensed by the FCC be allowed to have their licenses renewed when their news operations don't even hold their members of Congress accountable? Call the general manager of your local TV station and ask him/her to explain on tonight's news why the station should not have its license revoked for such a total dereliction of basic reporting.